SOLD OUT! 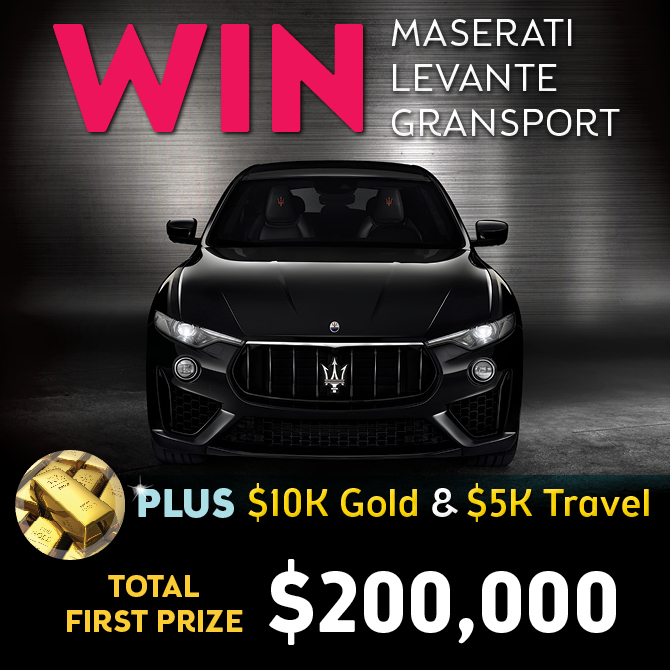 WIN Maserati Levante + $15K Extras OR $200K Gold! Don't miss your chance to WIN the ultimate in Italian excellence! The Maserati Levante GranSport meets every need when it comes to comfort, convenience and driving experience. PLUS, you’ll take home $10,000 Gold Bullion and a $5,000 Flight Centre Voucher. Or, you can simply take $200,000 Gold and spend it as you wish! With tickets only $10 each and limited to 100,000, you'd better hurry - the last 6 Car Draws SOLD OUT EARLY! Entries close 29 April 2019. Drawn 1 May 2019. Will all this be yours? Experience the dynamic excellence of the Maserati Levante GranSport. Enjoy the Harmon Kardon premium 14-speaker sound system and 8.4" Maserati Touch Control Plus. Sumptuous leather, handcrafted contrast stitching and ergonomic seats guarantee style and comfort. This car will stir your emotions. Featuring panoramic sunroof, ZF eight-speed automatic transmission, and 12-way power sport seats with memory. You could experience Italian excellence. See T&Cs for more information. Don't forget our bonus draw! Buy a ticket today and know that you're helping people in need. It truly is the best way to give. Become a myplace member today and never miss your chance to win more! Become a myplace member and you could be rewarding yourself every week, every draw and every year! Buy more tickets to increase your chances of winning 1st Prize and win extra Gold with 1st Prize.